You too can bid on Steve Jobs’ turtleneck and other random junk! If you’re a founder who’s feeling hot after getting some new seed funding and want to treat yourself, may I recommend purchasing the entire wardrobe of Silicon Valley’s greatest Versace menswear aficionado and wearing it as you berate employees in your office? Steve Jobs, the late co-founder of Apple, famously posited that good artists copy and great artists steal, so why not apply this to your founder fashion sense? The estate of Jane Fonda seems to creepily own loads of Jobs’ personal effects, including shirts, documents, business cards, bow ties and the crown jewel: one hella fly NeXT-branded turtle neck that Jobs wore (starting bid: $500). 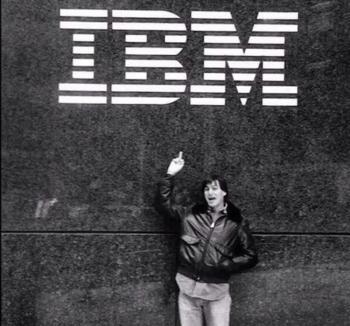 The most expensive of Jobs’ clothing is the leather jacket he was wearing in the photo below, where he’s flipping off an IBM sign (starting bid: $4,000). All in all there are 32 items up for bid. Julien’s Live, an entity that prides itself on being “the auction house to the stars,” is handling the auction, which also includes such national treasures as a lock of Marilyn Monroe’s hair (starting bid: $5,000) and Keanu Reeves’ signed Wayne Gretzky hockey jersey (starting bid: $1,000). I’m partial to Jobs’ purple Apple duffel bag, but I don’t think I’ll have enough cash to grab it if I carry out a bidding war on his electric razor/bathrobe gift set. Oh well.